Eclectic (at Best): The North Cascades Beckon! One of the features of a drive along Interstate 5 between Birch Bay and Seattle is a view of the Cascade Mountains lying to the east. During the first part of the drive, weather permitting, Mt. Baker (a dormant volcano and third largest peak in Washington state) provides irresistible scenery. 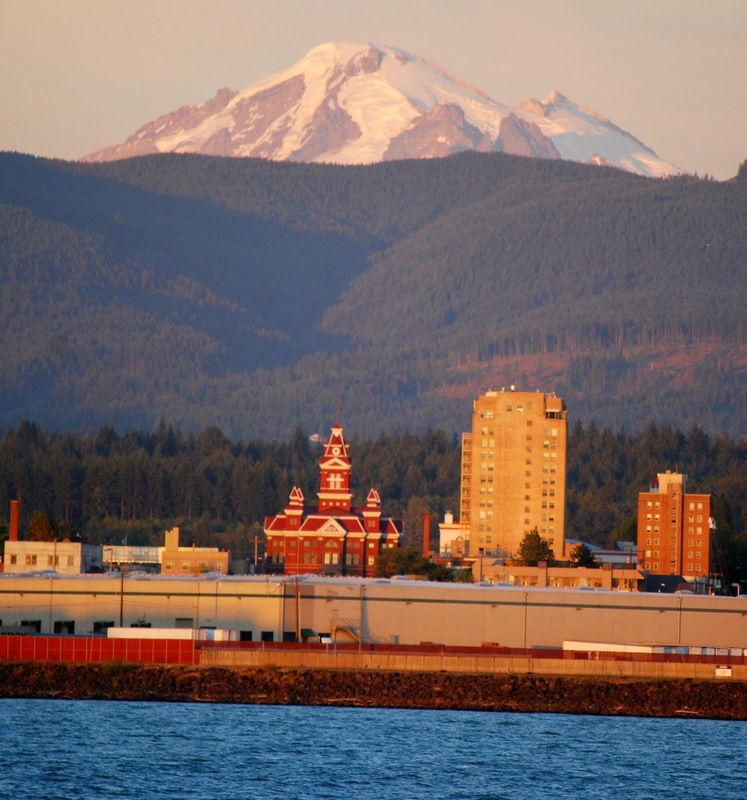 Though the mountains have been frequently in view, I have sampled the Cascades mainly through visits to Mt. Baker, driving on a few occasions to Artist Point in the latter part of summer when the snow is finally cleared and the road to it is open. Also, I have sped several times across the Cascades driving on Interstate 90 to get from Seattle to points east. Driving this four-lane highway, I have enjoyed quick glances around, especially when crossing Snoqualmie Pass. However, I have yet to take the time to get out of the car to look around. 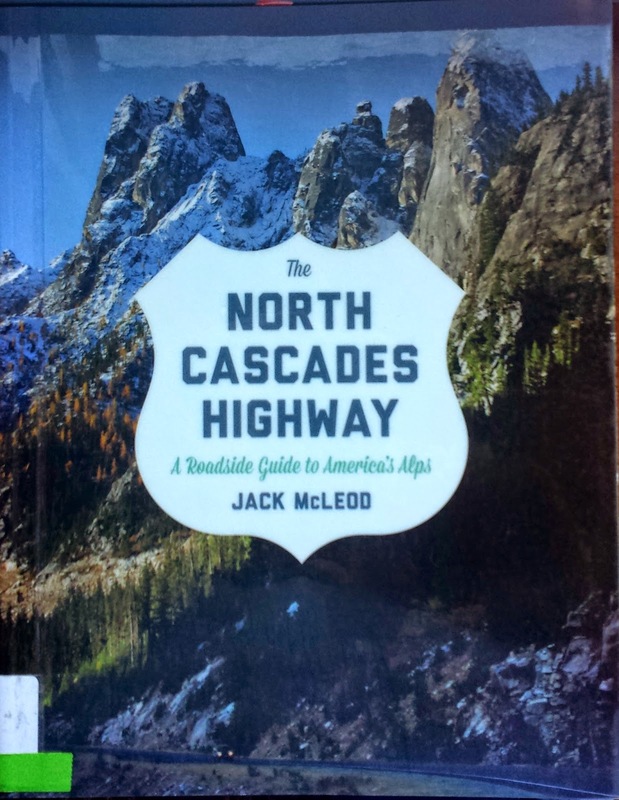 My resolve to devote more time to exploring and enjoying the Cascades was fortified when I recently read The North Cascades Highway: A Roadside Guide by Jack McLeod. This book has convinced me that it is time to explore the mountains. They are simply too close to ignore. My Birch Bay condo, according to Google maps, is a mere 90-minute drive from the start of a spectacular 83-mile drive across the mountains on Washington State Highway 20. 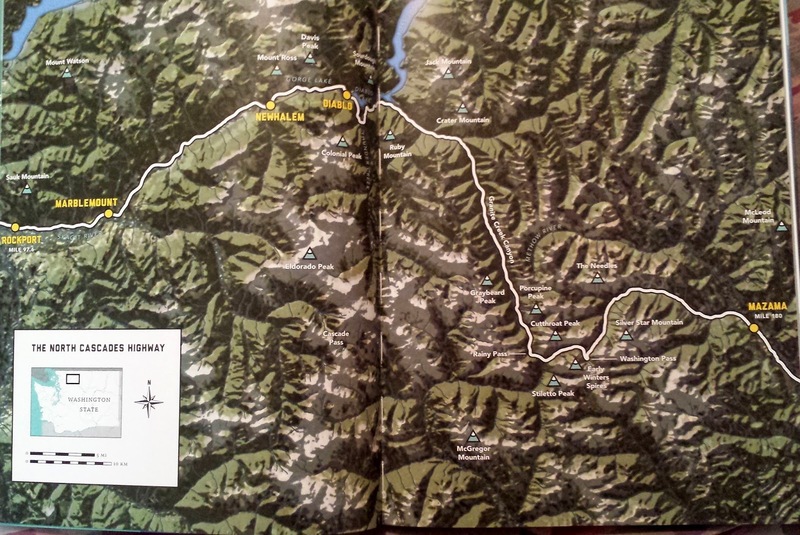 The drive starts at mile 97.6 of the highway (in Rockport) and ends at mile 180 (in Mazama). When driving the highway during its open months, first-time visitors will find likely McLeod’s book of great value. It advises visitors of the best places (identified by milepost number) to stop for superior views, and it suggests trails to take to see vistas not visible from the highway. In fact, one of the main messages of the book is to get out of the car and look around. From the highway, visitors can see numerous high peaks (with such colorful names as Bonanza [9,511 ft.], Stiletto [7,660 ft.], Switchblade [7,805 ft], and Cutthroat [8,050 ft.]) and mountains (such as Hozomeen Mountain [8,071 ft.], Jack Mountain [9,066 ft.], Sourdough Mountain (6,120 ft.], and Crater Mountain [8,128 ft]). Also, the drive follows the Skagit River for many miles, and it goes near three large lakes (Gorge, Diablo, and Ross Lakes), all man-made to provide power to Seattle. A couple of the Passes (both not far from Mazama) have especially interesting features. Rainy Pass (mile 157) is, according to McLeod, “the final barrier to moisture-filled clouds from the Pacific, which drop a yearly average of fifty-six inches of rain. The pass separates the wet west from the dry east.” This pass is also “a trail hub for hikers of all levels” writes McLeod, who suggests some alternative walks. Of course, the truly brave could get on the Pacific Crest Trail near this pass and walk a couple thousand miles to Mexico. Five miles from Rainy Pass lies Washington Pass (mile 162.2), which according to McLeod is “the most spectacular and most photographed slice of the North Cascades” with views of the Liberty Bell and Early Winters Spires. Because of the type of rock in this area, it is a favorite place for rock climbers. Next year when I travel this stretch of Highway 20 for the first time, I intend to have The North Cascades Highway at my side to help determine where to stop and to assist identifying what I am seeing. 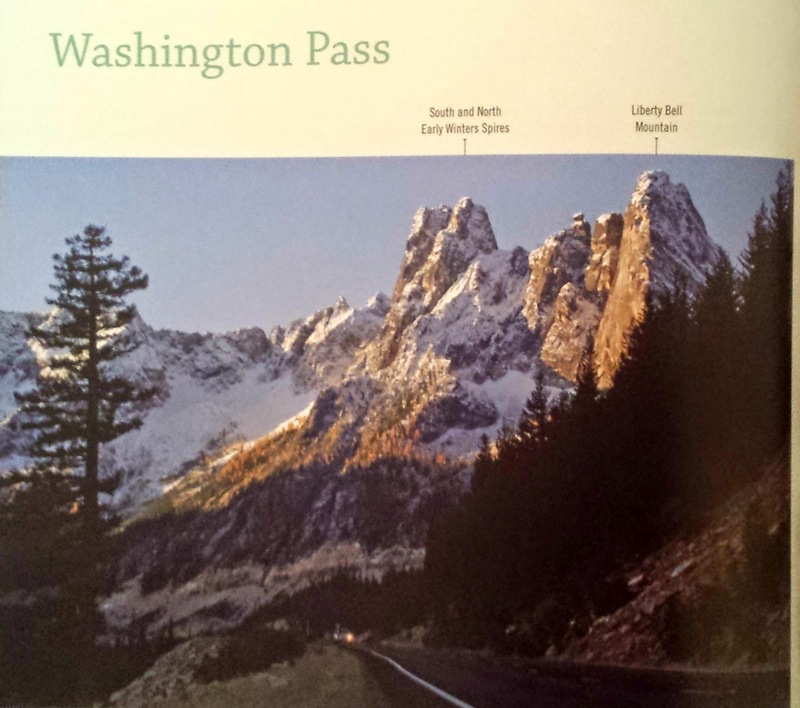 The book is stuffed with pictures of views from the highway with labels identifying the prominent features. In addition to the travel advice, the book is heavy on geology (answering the question: What kind of rocks are those? ), with a smattering of poetry and exhortation (“Get out of the car and look around”). When making this trip, I certainly plan to get out of the car and walk some (short) trails. To help with that, I am going to consult another recently published book such as Hiking the North Cascades: A Guide to More Than 100 Great Hiking Adventures by Eric Molvar or one the other books that have been written on this topic.